The first thing you notice about this remarkable recording is the unusual warmth and tonal vibrancy of the harpsichord, built in 2013 by Huw Sanders after a German two-manual model from around 1710. 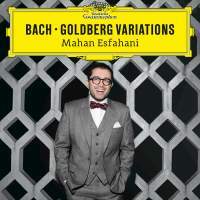 Mahan Esfahani obviously revels in its capabilities as he takes you on an arresting journey through Bach’s Goldberg Variations, where his sophisticated virtuosity, stylistic aplomb and strong personal profile give fresh and meaningful voice to this well-travelled score. His navigation of the music’s structure (with all repeats intact, including those in the Aria da capo) is carefully considered without sounding in the least bit studied, or different for the sake of being different. Take the opening Aria, for example. Esfahani provocatively pares down the embellishments à la Wilhelm Kempff and Igor Kipnis, but brings them back on the repeats. He takes advantage of each manual’s timbral distinctions to the point where the cross-handed variations emerge with uncommon clarity and deft contrapuntal interplay. Consequently you perceive the pulse but not the bar-lines. Usually Variation 8’s downwardly spiralling imitative lines come off blurry on account of their close proximity, but not here. Moreover, Esfahani’s shapely and variegated articulation of Vars 17 and 20 transcends the étude-like fingerwork, tapping directly into the music. At the same time, the harpsichordist characterises certain variations principally through embellishment and tone colour. His first pass across the A and B sections of Var 7’s Siciliano duet employs registrations with octave doublings that are removed on the repeats, replete with mini-cadenzas bridging each section. Although the lyrical Var 13’s repeats sport elaborate embellishments, they never pull focus from Bach’s melodic trajectory, which is decorative enough! Listeners expecting the minor-key variations to be milked of every last expressive drop will be surprised (and hopefully convinced) by Esfahani’s headlong and straightforward handling of the canons at the fifth and seventh (Vars 15 and 21). Similarly, Esfahani projects the famous ‘Black Pearl’ Variation, No 25, from the bottom up, so to speak, with the left hand acting more as an anchor than as a backdrop to the right-hand threnody. The momentum carries through Vars 26-29, abetted by Esfahani’s mindful bravura, while he caps the fully embellished Aria da capo by taking his sweet time before uttering the final note. In his booklet-notes, Esfahani plays down his own abilities in face of past luminaries such as Wanda Landowska, Ralph Kirkpatrick, Isolde Ahlgrimm, Zuzana Růžičková and Alan Curtis. Don’t believe Esfahani’s modesty for one second. His Goldberg Variations clearly belongs in such company, and in all serious Bach collections.